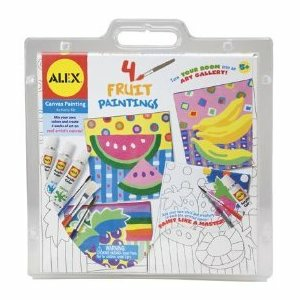 Alex toys 4 fruit painting mix your own colors & create 4 works of art on real artist's canvas! Turn your room into an art gallary! Just paint & hang! Inludes: 4 6" x 6" pre-printed canvases, 8 acrylic paints .4fl ounces each, 4 natural bristle brushes, painter's palette, painting guide.